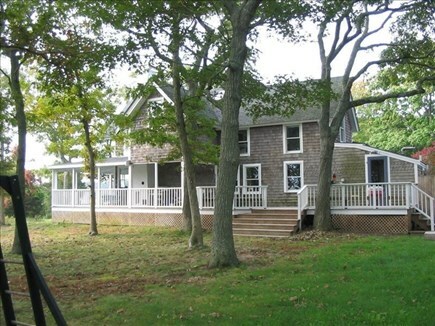 Huge wraparound porch overlooking Farm Pond and Nantucket Sound. Side of house looking over Farm Pond and Nantucket Sound. Living room with wide views of pond & ocean. Wood FP, flatscreen. Cozy daybed book nook. Good for napping, reading or extra guests. Looking from kitchen (all new appliances) to dining and living. Dining for 6-8 with views to Farm Pond and beyond. New floor and vanity in upstairs bath, looking out to hall. Upstairs bath has huge tub with waterviews, new floors. Pink room has double pull out and great views of pond. Treehouse room has great views, window A/C. Farm Pond House and yard. Sunset colors from porch. Great paddling on Farm Pond to fishing. 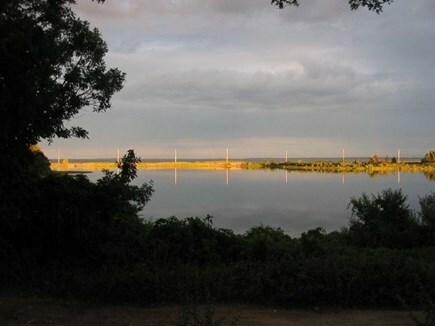 Farm Pond House sits right on the shores of Farm Pond, overlooking Harthaven, Chappaquiddick, and Nantucket Sound. 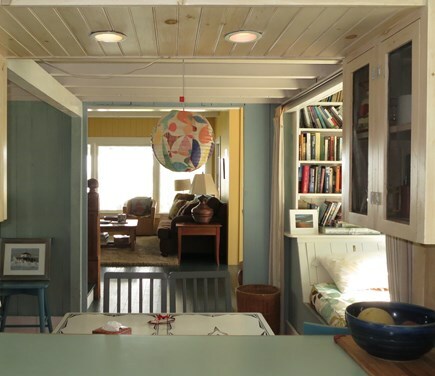 All painted pine floors, original rafters, beaded board walls. Four bedrooms upstairs, (California King, Queen, double, and double pullout) with full bath (and water views from the huge tub), all with high peaked ceilings and expansive water views. All bedrooms have A/C window units, though the lovely ocean breezes mean you might not need them. 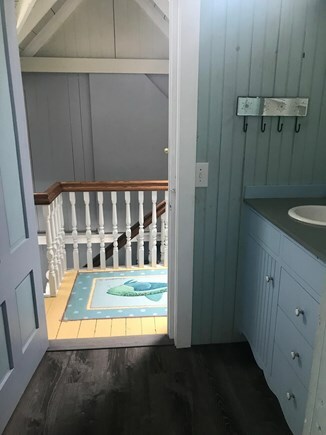 Sit on the 900-square foot wraparound porch, and contemplate where you might paddle or walk to - across to Harthaven Beach to fish, or bike or walk through the Land Bank trails around Farm Pond, or stroll up the street to tennis, park, or to town beyond. Just a ten minute walk to art galleries, shops, Tony's market, restaurants, bowling, ferries - everything you need. Five minute walk to Inkwell Beach. The house is beachy and cozy but with modern amenities: brand new stainless kitchen appliances (gas range) and new laundry in a separate laundry area. 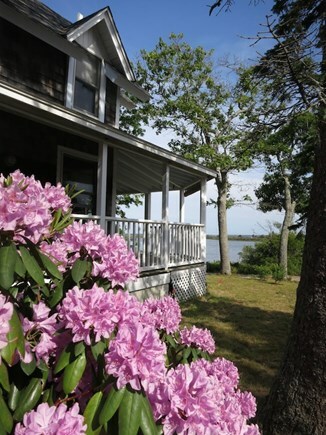 Living room has wide water views, a woodburning fireplace, piano, painted wood floors, and a dining area for 6-8. The Middle room/study has a cozy daybed nook (double) surrounded by bookshelves and another table for 4-6. It opens to the kitchen beyond, which has water views out all windows, lots of counter space, a pantry, etc. Huge mudroom for storing all your stuff, and a basement with ping pong, games, and a queen pull out and twin bed. The porch (partly covered, partly open to the sun) has dining for 6-8, seating for many more, including several places to sit and read and stare at the water for hours on end. Wide stairs for sitting and having your morning coffee or evening cocktails. Brand new high-end gas grill. Yard is large with lots of room to play. House comes with kayaks and canoe, includes all linens and towels. Additional pricing info: Cleaning fee $275; Pet fee $275 for up to 2 dogs. Negotiable discounst for multiple weeks. State and local taxes of 11.7% will apply. 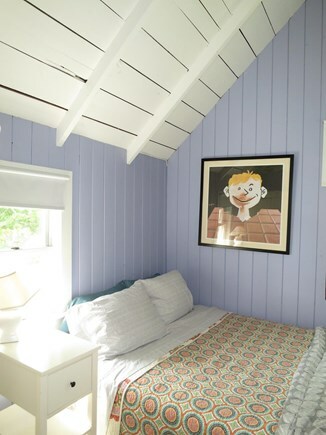 Yes, it is a quirky place and yes, it does have a bedroom that connects to another bedroom, but it is a great location and really an amazing view. Drinks and appetizers on the porch cannot be beat and so close to town and Inkwell beach that it is well worth it. We had 7 people in the house plus two dogs and it accommodated our needs excellently. Kitchen is well stocked and we had a ball. Jamie is a great hostess. I found the whole experience heavenly!!! Great location beautiful views and the 9 adults in our family. The location was great. We were able to walk into oak bluffs for dinner, the ferries, and any other activities. Easy access to the bike trail too. The house had 4 bedrooms up stairs that easily fit 8 of us adults and one slept in a reading nook on the first floor. 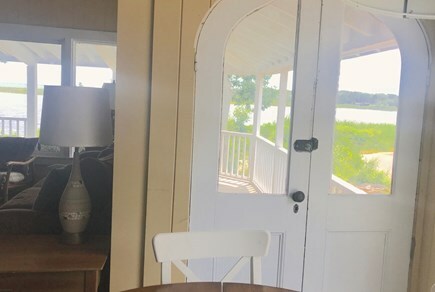 Kitchen had everything needed, and the wrap around porch was great to relax on and possessed a wonderful view of the pond and beyond that, the ocean. Outdoor shower was nice even on cooler evenings. We wouldn’t hesitate for a moment to stay here again if we come out to MV with our family or friends. 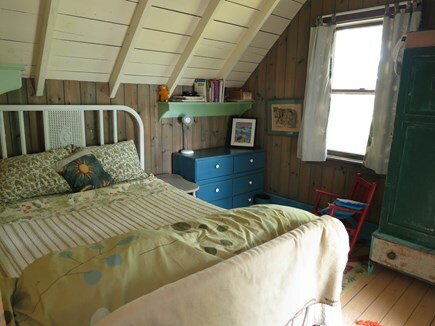 If you're looking for a slice of peaceful heaven, then Jamie's house is just the place to hang your hat. 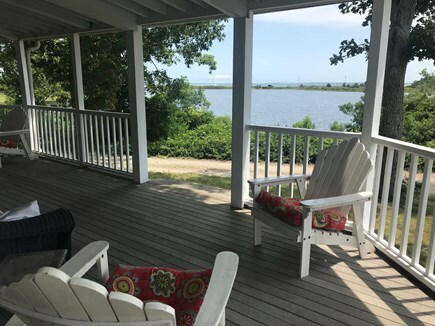 Jamie's house has a covered large porch, which overlooks Farm Pond, and Nantucket Sound beyond, where we sip our coffee and read the paper in the morning in total peace and quiet. In the afternoon, we might stroll down to Nancy's and have ourselves a lobster roll for lunch. There aren't many homes on MV in such a quiet location where you can also easily walk to restaurants, beaches, etc. 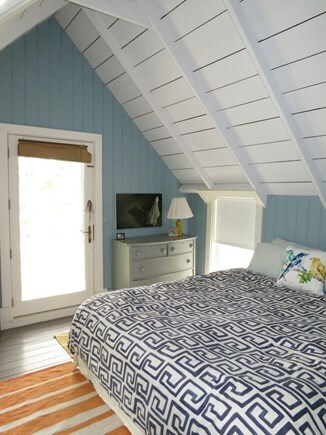 And there are also lots of places to sleep for those unexpected guests who will surely drop by once they hear you're on the island! Book now before it's too late! Big, rambling 19th century house right on Farm Pond! We loved our stay this year at Jamie's house! What a charming, and comfortable home. We had two families the first part of the week and no one felt on top of each other. The big wrap around porch is lovely with its breezes! We were even able to watch the Edgartown fireworks from the porch! The location is perfect for a family with teens like ours--all the kids could bike or walk over to Circuit Ave for some needed independence. And if you have young kids it's great because there is a yard for them to play in. We loved our stay and hope to be back! First time to Martha's Vineyard with my husband and this home was perfect! The back deck was a morning breakfast and Happy Hour retreat! Our adult children joined us for the last 3 days and fell in love with it too. Jamie was on duty answering all of my questions on where to get the best coffee to where to hike, bike, dine and sight see. We chose to rent bikes for a week and walk, taking Uber a few times to restaurants and it was a fantastic break from life. We highly recommend this endearing home which feels like you are in the country and a 10 minute walk/4 minute bike ride from all the action and dining. This is a truly idyllic spot - it couldn't have been better. We spent a week here and never tired of the views. The house is quirky (which I loved) as only an historic place can be. You'll never want to leave the front porch! Jamie made us feel very welcome - we wanted for nothing! Had a friends weekend here over Memorial Day Weekend. There were 8 of us, and the place felt like it could have fit more. The house is so broken up that if feels huge (I think it was originally two houses that were combined). The outdoor shower was a great amenity. The location is close to the ocean and right on a small lake which was perfect. It was also good to be close to the downtown but not in the neighborhoods that have houses too close together. It was about 10 minute walk to the restaurants and bars. Jamie the owner gave us very detailed instructions for the house, use of his kayaks, and tons of recommendations for things to do on the island. He was very responsive to make booking easy. Nobody wanted to leave and I hope we can make it back sometime. My family has stayed here four summers in a row. Between kids, friends, and parents, we never know quite how many people will be with us, but always find the perfect room for everybody of all ages. It's a peaceful, beautiful, and quiet setting, yet we can walk to town in minutes for food, entertainment, and fun. We use the kayak in the pond (and brought a stand up paddle board this year). Being so close to the bike path is a huge plus, and after our busy, busy, days - there's nothing better than relaxing on the porch with a view of the water. Jamie lives on the island, and is available/responsive if we ever need anything (which is very rare). The kitchen has everything we need, linens/towels are abundant, and the outdoor shower is delightful. We have been coming to MV for many years, and this house has been our favorite by far! For anyone looking for a wonderful week or two or three on the Vineyard, this is the place to stay. Jamie and Barry's home is truly special. With its deep history of being built from two historic structures--an old Tea Room and a Cottage house from the mid-1800's--this unique and extremely comfortable home is a special "heart"haven located in the back door to active Oak Bluffs center. Overlooking Farm Pond to the endless ocean, the wrap around porch is a relaxing place to hang out with a cocktail or three while the dogs lay by your side. Friendly neighbors, such as Vineyard's own Alison Shaw, are eager to make you feel at home and offer their local knowledge of the best of the Island's many activities, in this wonderful community. Go for a walk around the pond, or hop on bikes and cruise into Oak Bluffs for a relaxing dinner or night on the town with the kiddos! The dog-friendly home offers ample comfortable bedding and lounge-out spots for turning off and tuning in. The romantic fireplace throws shadows on the beautiful open living area as you crack into some local lobsters, or dig into delicious BBQ from the close by Smoke N' Bones. An awesome collection of books adorns an entire wall above the daybed that invites one to just take a load off and chill out (I recommend the Rolling Stone Interviews compiled by the legendary Jann Wenner). There is a very big inviting yard that is always freshly mowed (thanks Barry!) where the kids love to run and play. An huge outdoor shower completes the outside amenities in Vineyard style. All in all, I can't say enough about this place, and I have stayed all over the island with my wife and two active boys (Chilmark, Upper and Lower Makonikey, Edgartown, Vineyard Haven, you name it!). We were lucky to stumble upon this home and will be coming back for years to come. Thanks Jamie and Barry for opening your home to us and allowing us to make great family memories in lovely Hearthaven! I raised my children in this house for many years, and am now one of the publishers of the MVTimes, a local community newspaper. I've been on MV for at least part of the last 35 years and think there's no better place on earth. The views are just amazing. 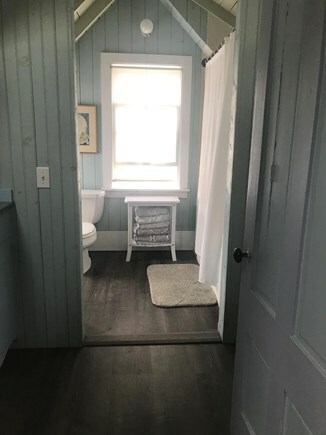 From your pillow, or from the sofa, or while you cook, or grill, or sit by the fireplace, (or soak in the tub), you can stare at birds (we have Osprey, Great Blue Herons, egrets, ducks, etc), an occasional otter in the pond, and beyond to Harthaven, Chappaquiddick's North Neck and Cape Pogue, and Nantucket Sound. I love the fact that you can walk out the back door and be in town in ten minutes, or at the beach in less than five, (walking or paddling a kayak or canoe) but it's so quiet here, you'll think you are up-Island. 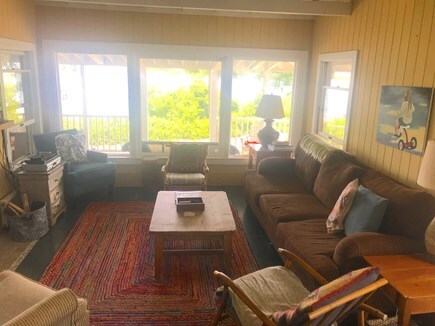 Easy bike to several bike paths, through the woods or along the beach, stroll to galleries, bbq, bowling, ferries, shops, restaurants, etc., or just never leave and stay on the porch and stare at the water, or read some of the hundreds of great books we have. For rainy days, there's a pingpong table in the basement. The house has all the modern amenities you'll want- brand new stainless appliances (great gas range, quiet laundry and dishwasher), but is a classic OB Victorian with beaded board walls, high raftered ceilings, wood-burning fireplace, painted wood floors. The back half of the house was once a Campground ''gingerbread house'', then became a tea room on Circuit Ave., before being moved to join the front part of the house, on one of the original Copeland plan lots. It was moved to the pondside property 100 years ago. I have really friendly, quiet neighbors and many of my tenants return each year. Oak Bluffs is the best! There's excellent restaurants, lively harbor bar and restaurant scene, miles of trails and great fishing, biking, walking. Colorful gingerbread cottage community (400 tiny houses!). Great fishing and miles and miles and miles of white sandy beaches, with gentle entry for little kids. Lots of really unique shopping, and even a very cool bowling alley.